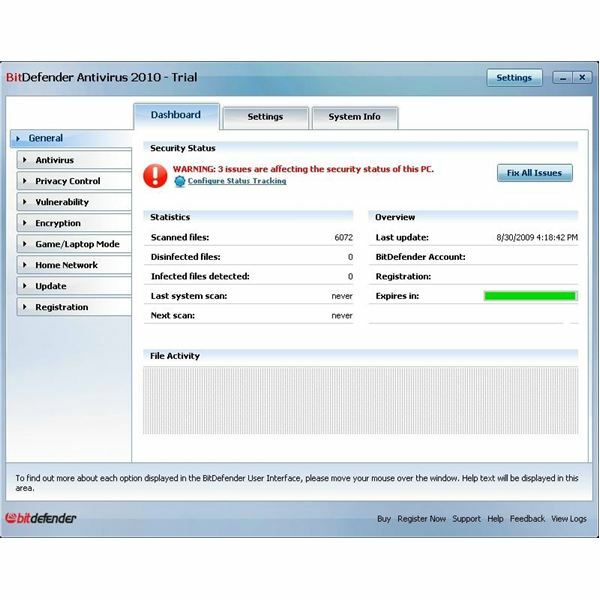 As mentioned above, I reviewed BitDefender Antivirus (BDA) 2009 in early 2009. I felt BDA 2009 was a robust antivirus product with a few useful ‘extras’ to make paying for a subscription worthwhile. You can find the full review here. 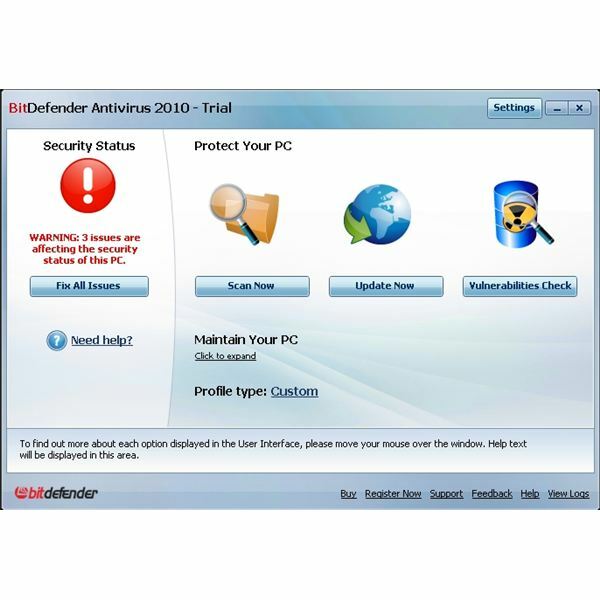 Here is a partial listing of features offered in BitDefender 2010. Active Virus Control – monitors programs running in memory looking for suspicious activity such as registering DLLs or moving items to or from the Windows install directory. As a program becomes more suspicious, it adds up points for that application. 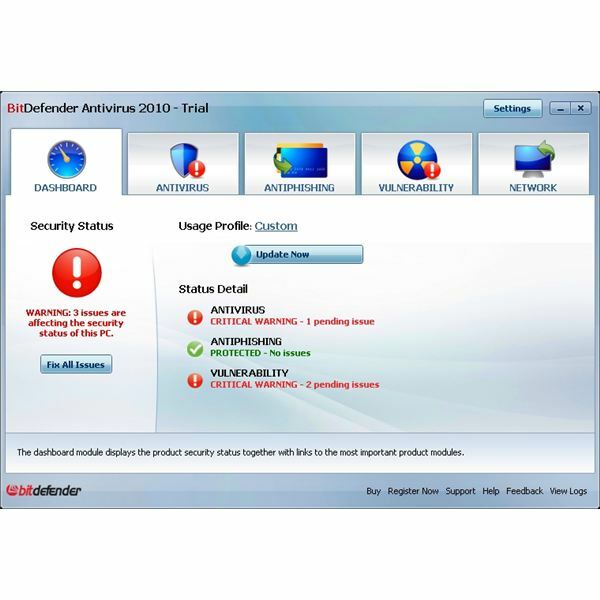 If it hits the threshold for activity, BitDefender will warn the user and shut down that program. Usage Profiles – configures the product based on activities a “typical" user or gamer would perform. A custom built profile is also available. Installation on my test system was easy and relatively quick. It was nice the installer detected another antivirus solution that was installed and warned me that having multiple products installed could cause stability issues (This is applicable to most if not all Anti-Virus packages, not just BitDefender). After a quick reboot, the install configuration Wizard started. You are first asked to pick a profile for the install asking if you are a “typical" user, a “gamer" or if you want to run through a custom profile. I selected the custom profile not really understanding the difference between the first two. Next, you are asked if your computer is on a home network (allows you to manage other BitDefender computers) and if the PC is a laptop so BitDefender doesn’t perform scans while running on battery. Lastly, you are asked if you are a novice, intermediate or expert user. This affects the main GUI by hiding or displaying options depending on what you pick. After you exit the wizard, a definition update is performed and quick scan is run. The GUI is pretty similar to the 2009 interface without making any drastic changes. The left hand side outlines the main tasks which vary depending on which GUI level you chose. Figure 1 below displays the “Novice" GUI, Figure 2 the “Intermediate" and Figure 3 the “Expert" interfaces. Performance is similar to BDA 2009 using roughly the same resources. Running a full scan consumes 15-30% of the CPU with 15-20MB of RAM. Privacy Control – ability to change between aggressive, default and passive mode – will block cookie requests and scripts. Unfortunately, it appears BitDefender dropped the AntiPhishing module that seemed to work quite well in last year’s edition. The other features such as IM encryption, Game and Laptop modes all remain unchanged from BDA 2009. It’s unfortunate 2010 seems to be a small step backward from the 2009 edition, dropping the Anti-phishing plugin and the vulnerability check that didn’t seem to work as well this year over last. Pricing remains the same from last year with one PC for $24.99, 3 for $29.99 or $49.99 for 5 – for one year. All of BitDefender’s products include free 24/7 phone, email or chat support as well. If you have more than one PC at home, it’s definitely worth going for the multi-PC discount. Overall, Bitdefender is a solid product, but the “extras" feel like cheap add-ons – definitely not bringing value-added tools like last year. As mentioned in the 2009 review, Antivirus vendors need to constantly add extra tools (and thus value) to their base Antivirus offerings – it’s the one thing they can do to get users to pony up for a license as opposed to using a free alternative. BitDefender fell down a bit with the 2010 version – hopefully next year will see some additional innovation. Even with the lack of a few of the nice extras from last year, I’d still recommend Antivirus 2010 due to the price and performance of the package.